Thai Boxing Or Muay Thai History Muay Thai is considered by some to be derived from a general martial art style native to Southeast Asia, and the first of these styles to be popularized outside of Southeast Asia. 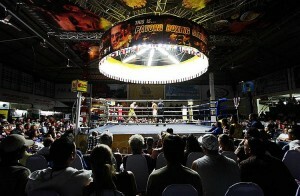 Muay Thai began as Krabi Krabong, the Siamese weapon-based style . When disarmed, Krabi Krabong practitioners resort to unarmed fighting techniques centred on kicks and wrestling -like throws. Developing through time and natural evolution of the art, it gave birth to Muay Boran, ancient style Muay Thai. As the basis of battlefield warfare evolved technologically, hand-to-hand combat was no longer required within the military. Muay Boran was divided to Muay ThaSao (North), Muay Thai Korat (Esarn or Northeast), Muay Thai Lobburee (Center region) and Muay Thai Chaiya (South).